San Juan is Puerto Rico’s capital and largest city. 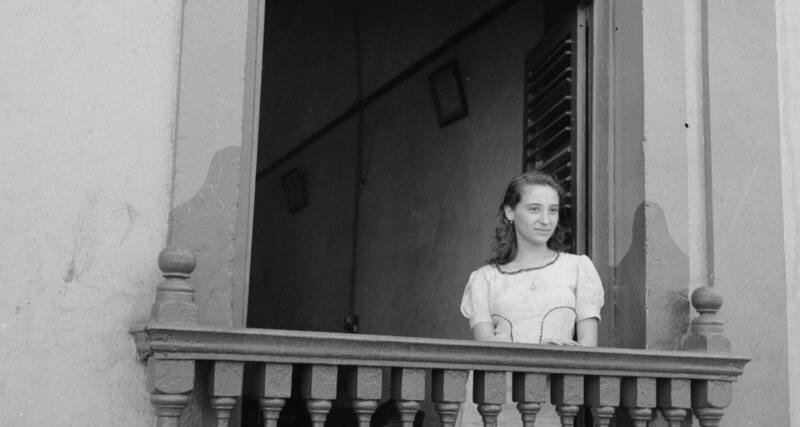 Because of it’s location on the island’s Atlantic coast, San Juan is an important seaport and a hotspot for tourists because of its long and colorful history. However, life was much different in San Juan a few decades ago, and these photographs reveal a side of San Juan that many have never seen. 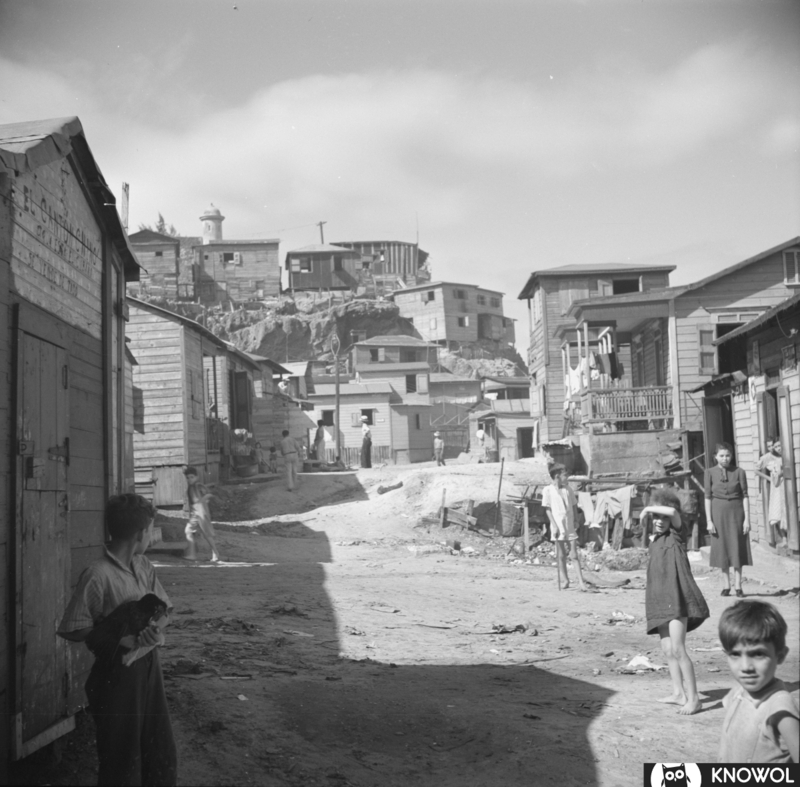 Here are pictures of daily life in San Juan from 1928 – 1940. 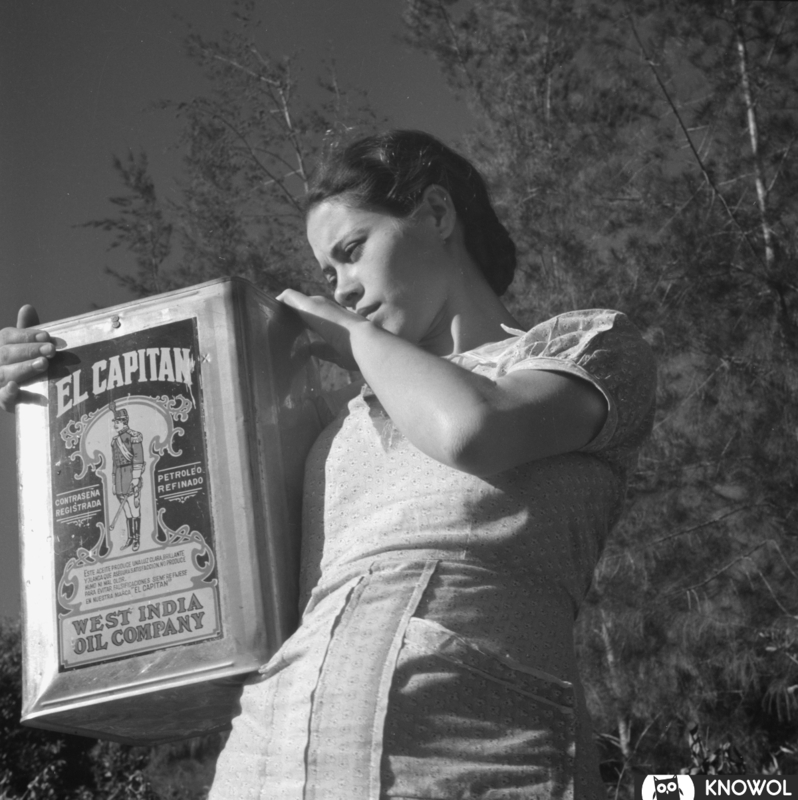 Gasoline cans were one of the most valued utensils in old Puerto Rico, due to a lack of clean water pumps, Puerto Ricans would sometimes travel long distances with gasoline cans to fill them with clean water and bring them home. This was especially true in the hills. 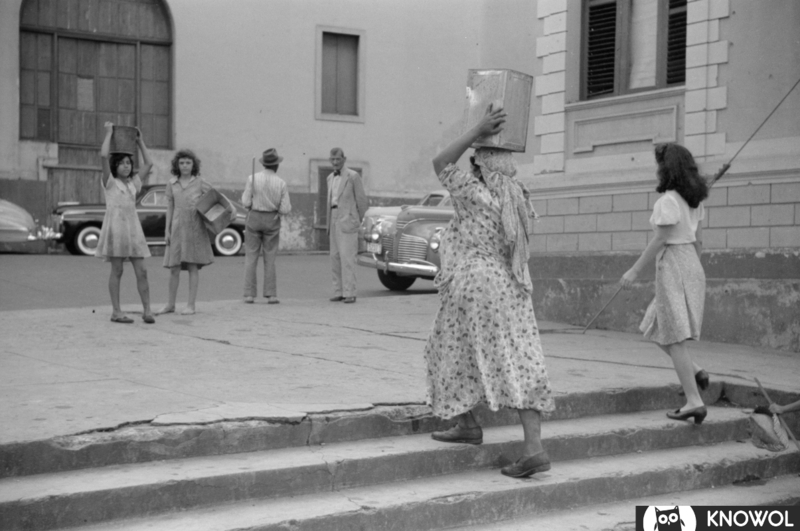 So if you’re Puerto Rican and your relatives had buckets to catch rainwater, now you know why. 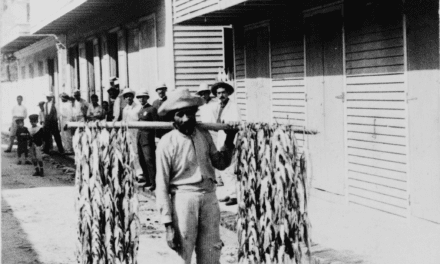 Longshoremen work at ports helping ships load and unload cargo. 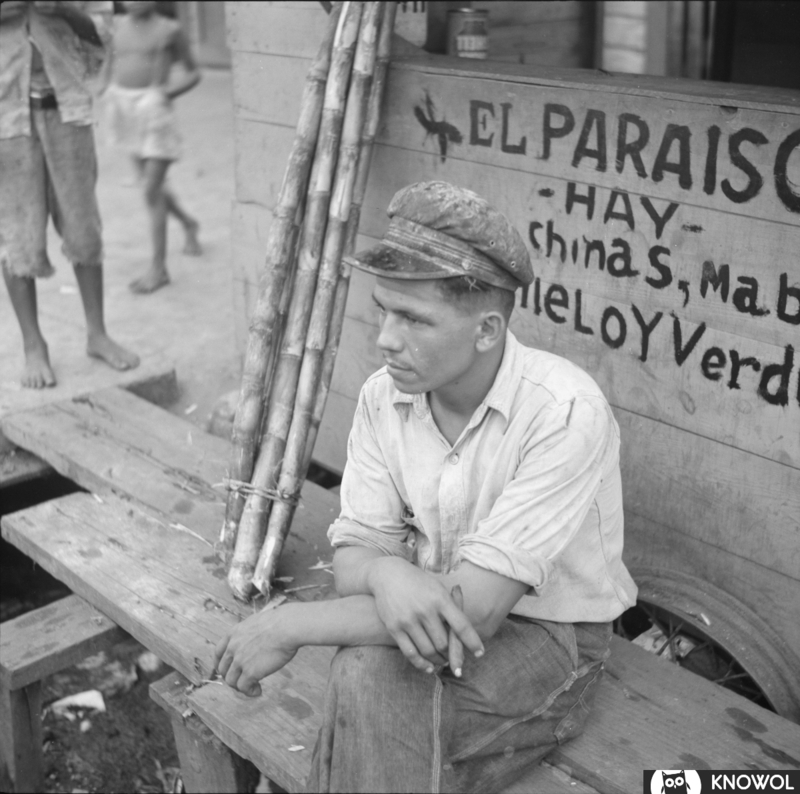 This young longshoreman is sitting at the docks of San Juan while smoking a cigar and waiting for work. 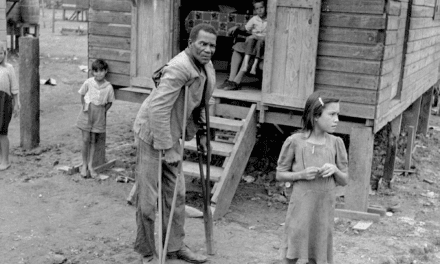 This picture was taken in January, 1938. 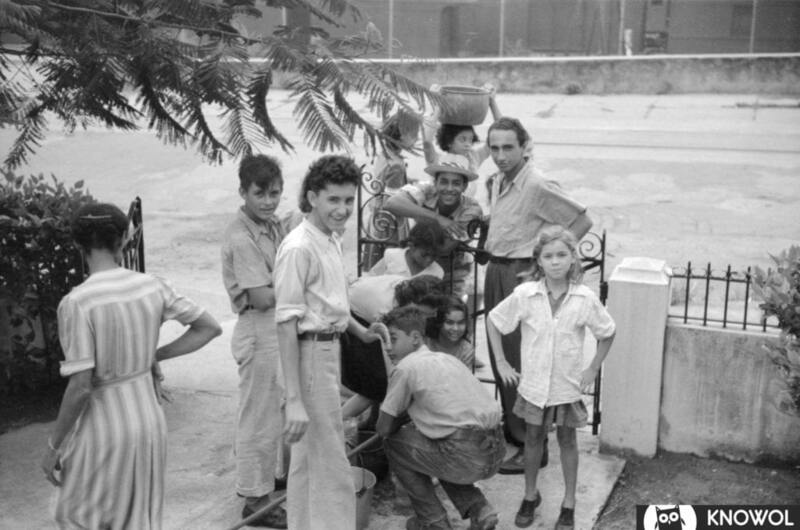 A lively street scene in San Juan, Puerto Rico. Picture from December 1941. 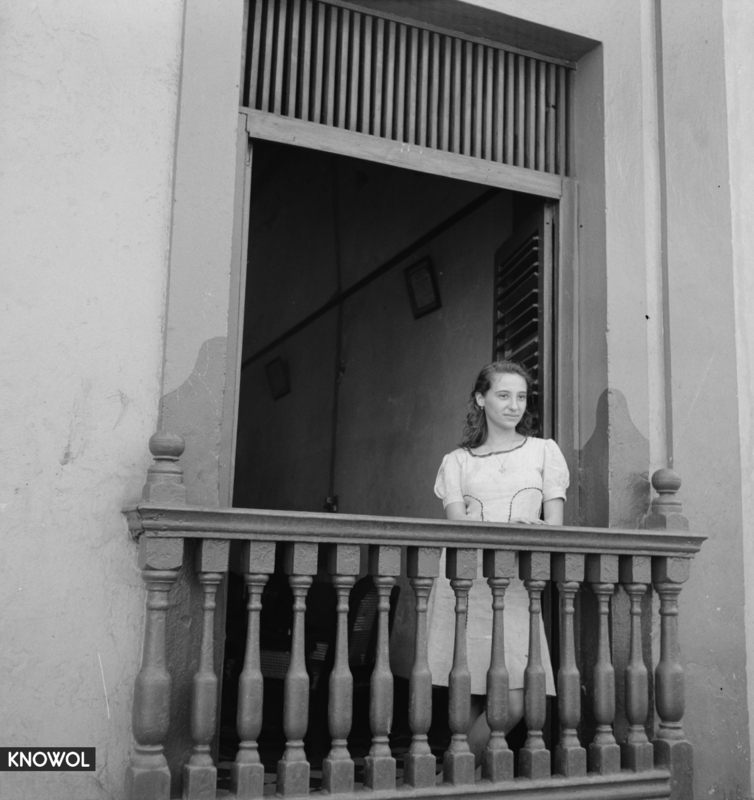 A beautiful young Puerto Rican woman watches the street scene below from her balcony. 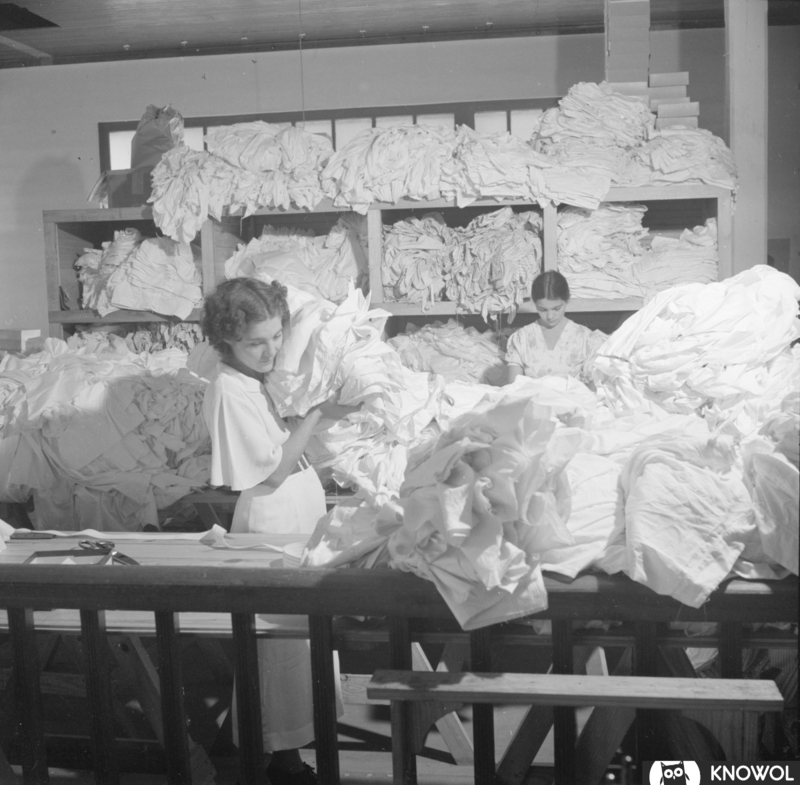 Picture from January, 1942. 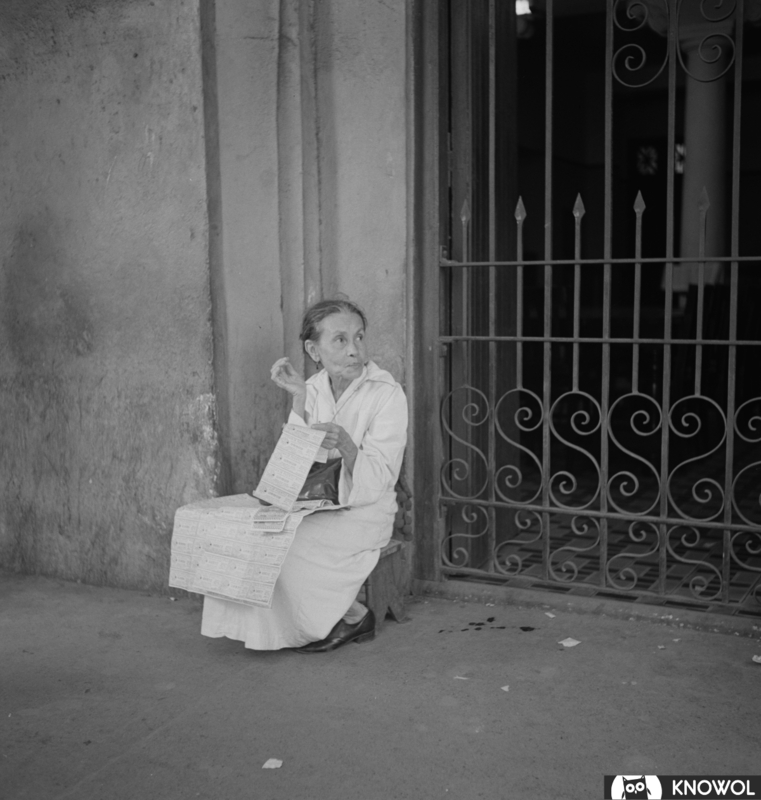 An older Puerto Rican woman looks at postcards for sale in downtown San Juan. 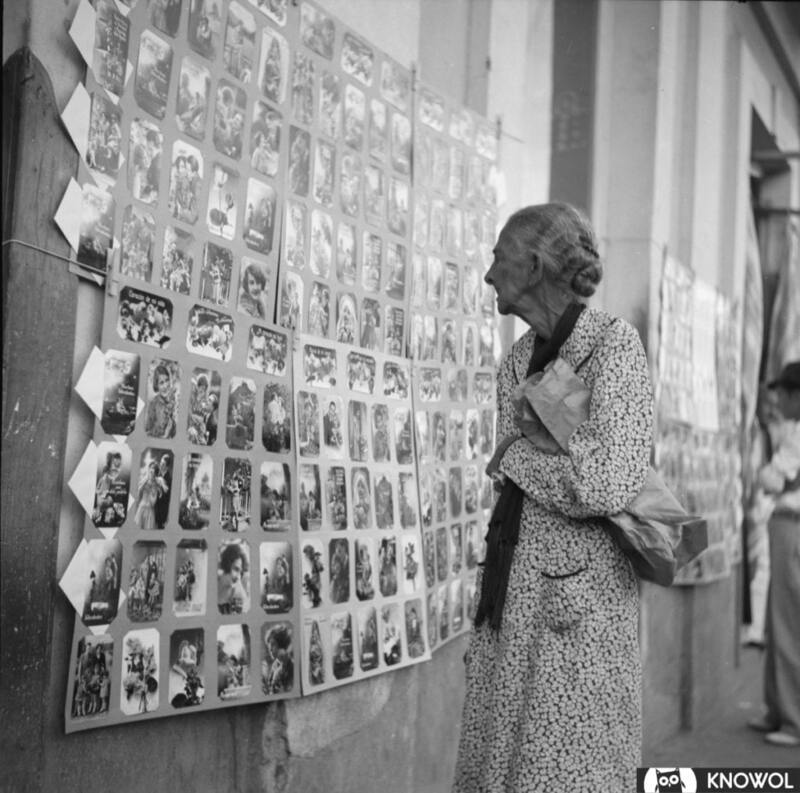 The postcards would be hung up against the wall and sold to both tourists and locals alike. 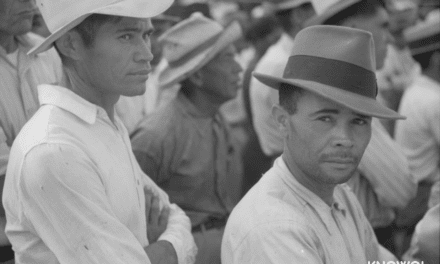 Picture from December, 1937. 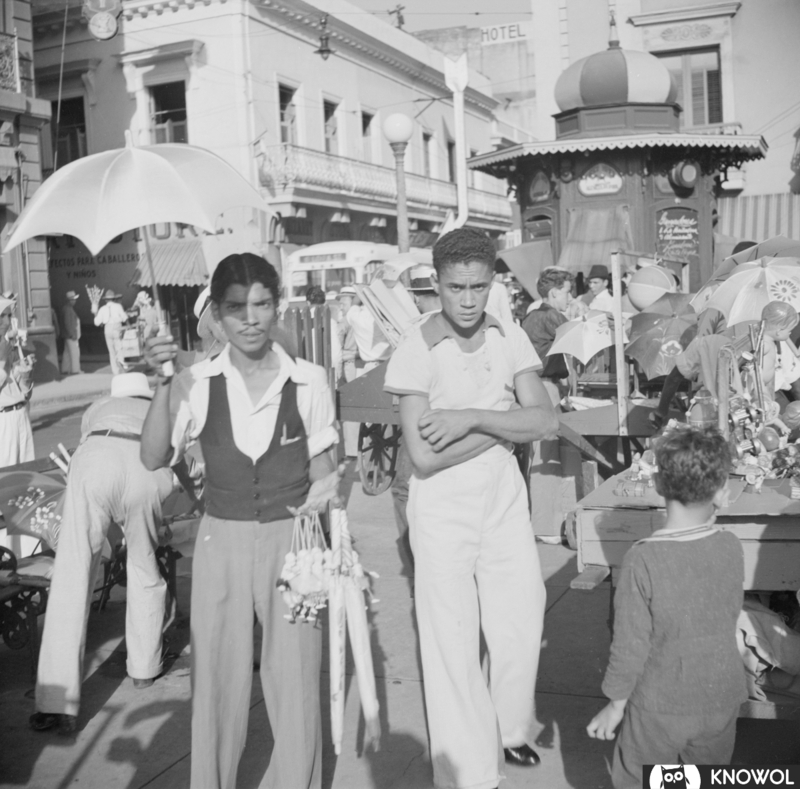 These men set up shop in the municipal square of San Juan to sell their toys, along with other merchants. 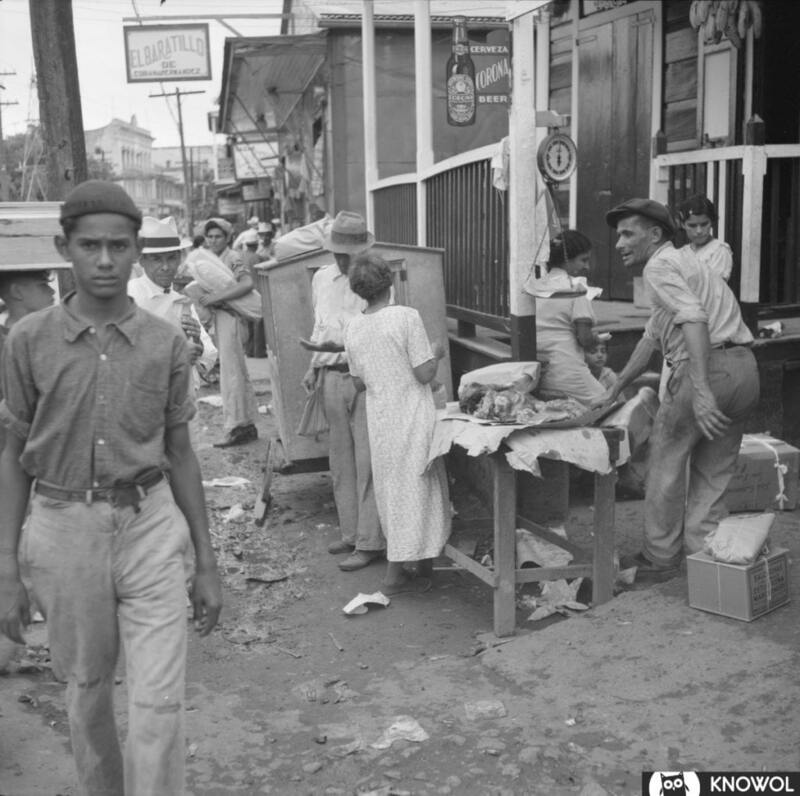 Umbrellas for sale were used to protect Puerto Ricans from the scorching Sun. 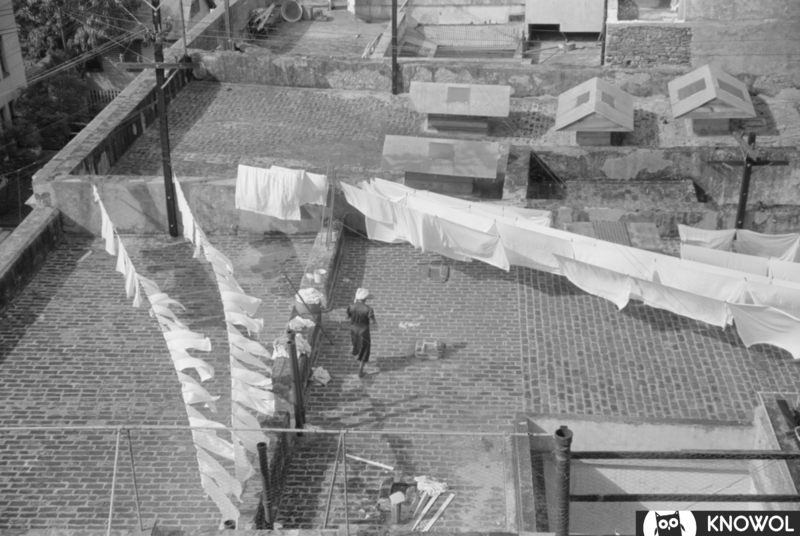 Photo from December, 1937. 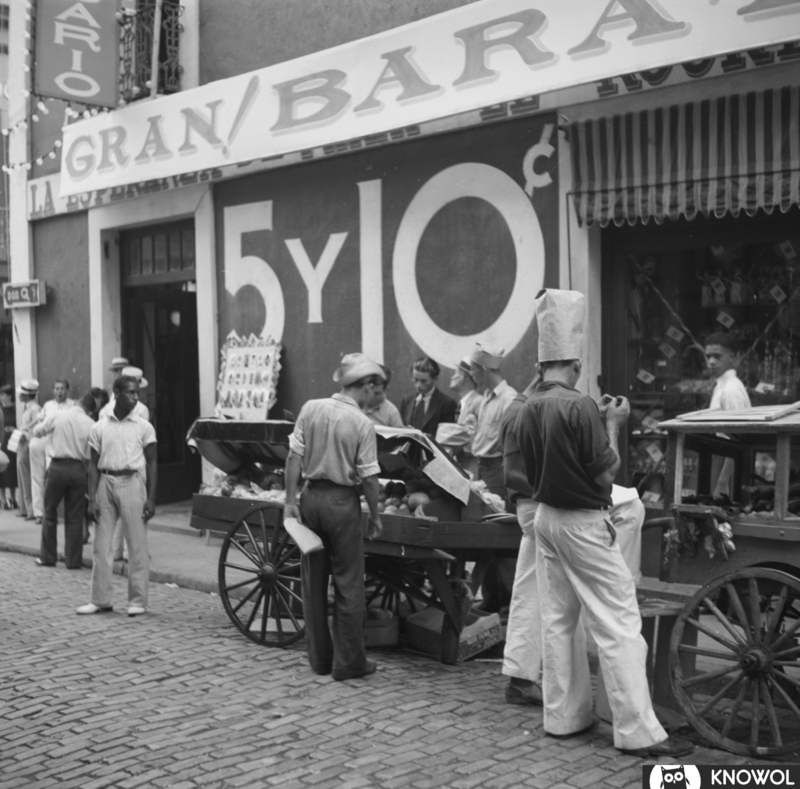 A five and ten cent store in 1937 is the equivalent of a $1-$2 dollar store in 2017. 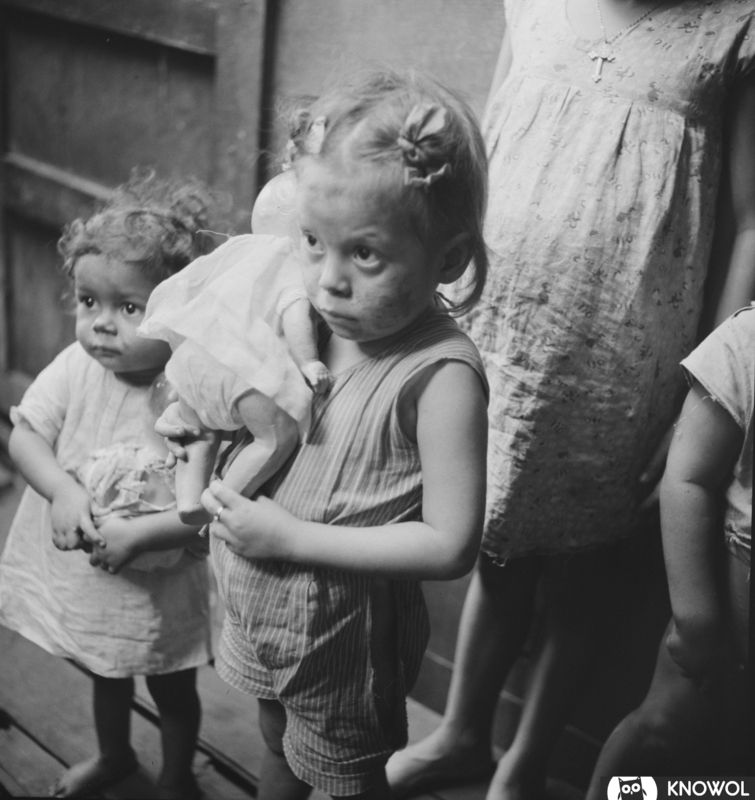 This picture was taken in December, 1937. 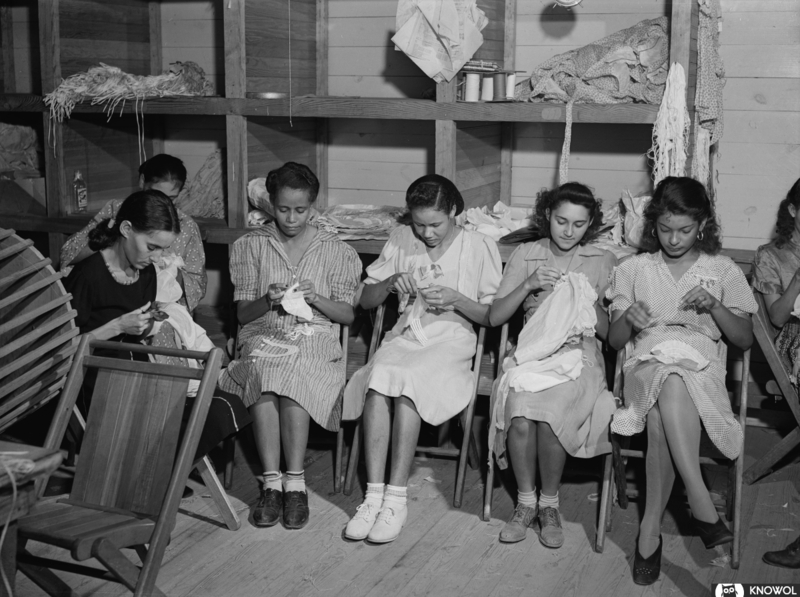 Young seamstresses working to make dresses, shirts and other forms of clothing in a needlework factory in San Juan, Puerto Rico. 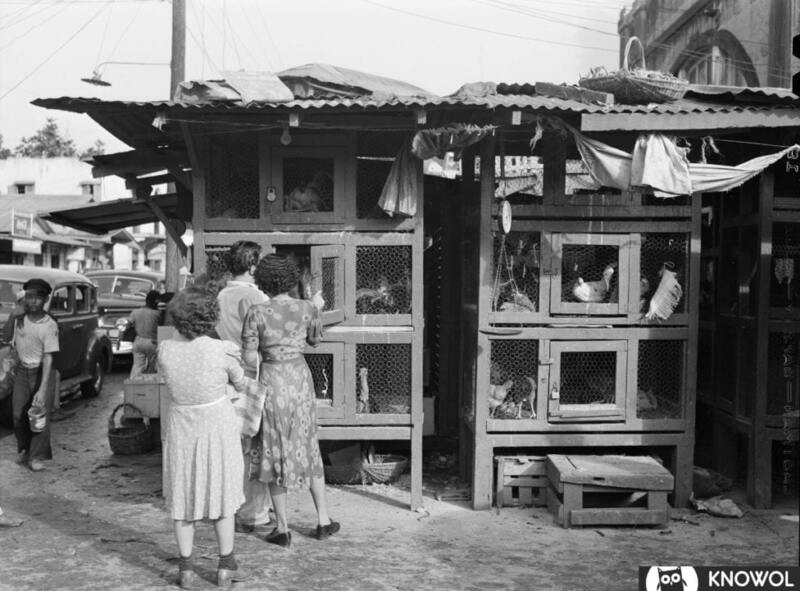 January, 1942. 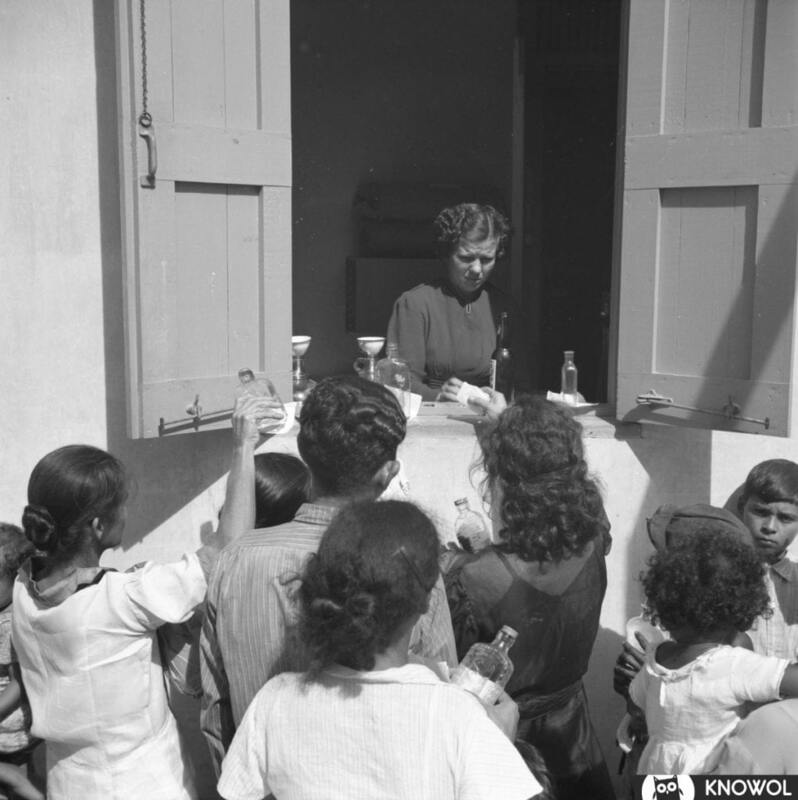 Distribution of free medicine outside a P.R.R.A. 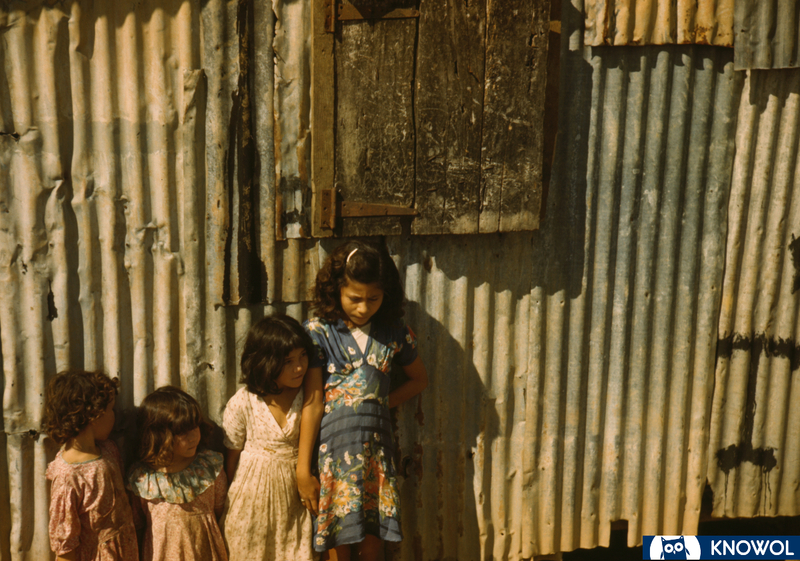 (Puerto Rico Resettlement Administration) health center. San Juan, Puerto Rico. January, 1938. 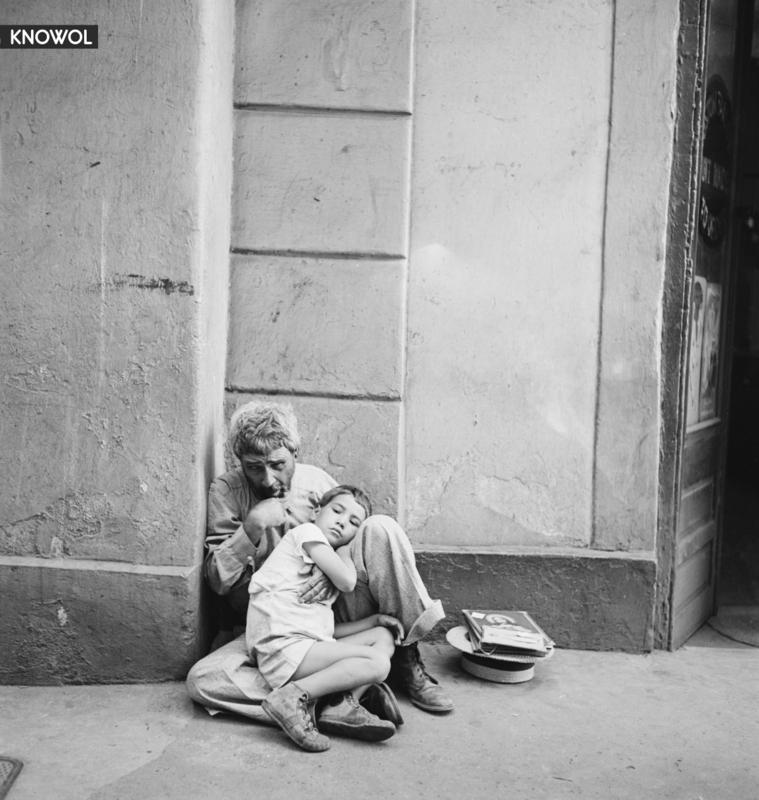 A homeless man holds his son on the streets of San Juan. Next to him is a religious picture and a hat he would use for collections. December, 1941. 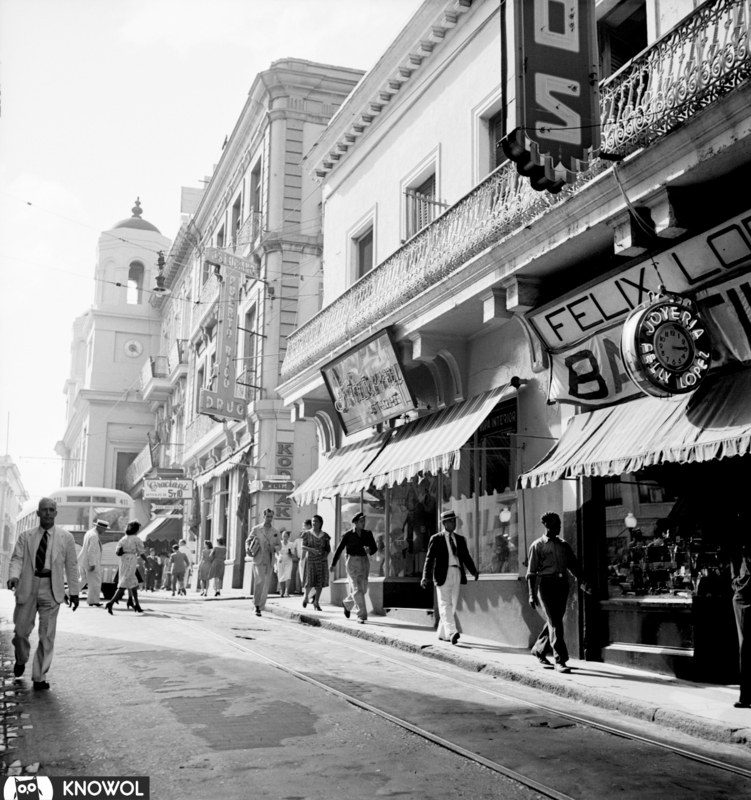 La Perla was established in the late 19th century. Initially, the area was the site of a slaughterhouse because the law required slaughterhouses and homes of former slaves and homeless non-white servants to be away from the main community center; in this case, outside the city walls. 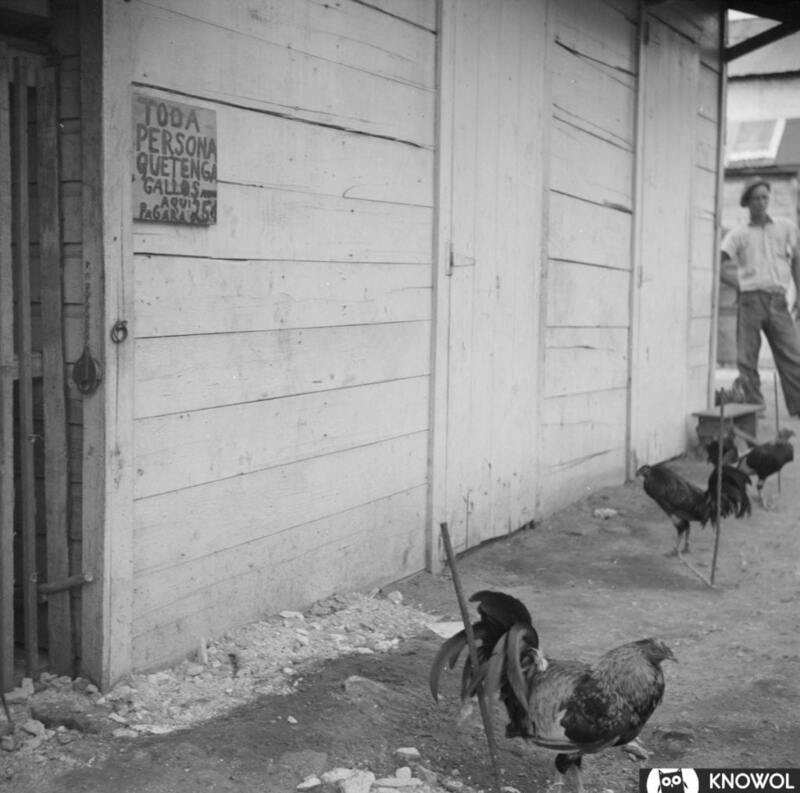 Sometime after, some of the farmers and workers started living around the slaughterhouse and shortly established their houses there. 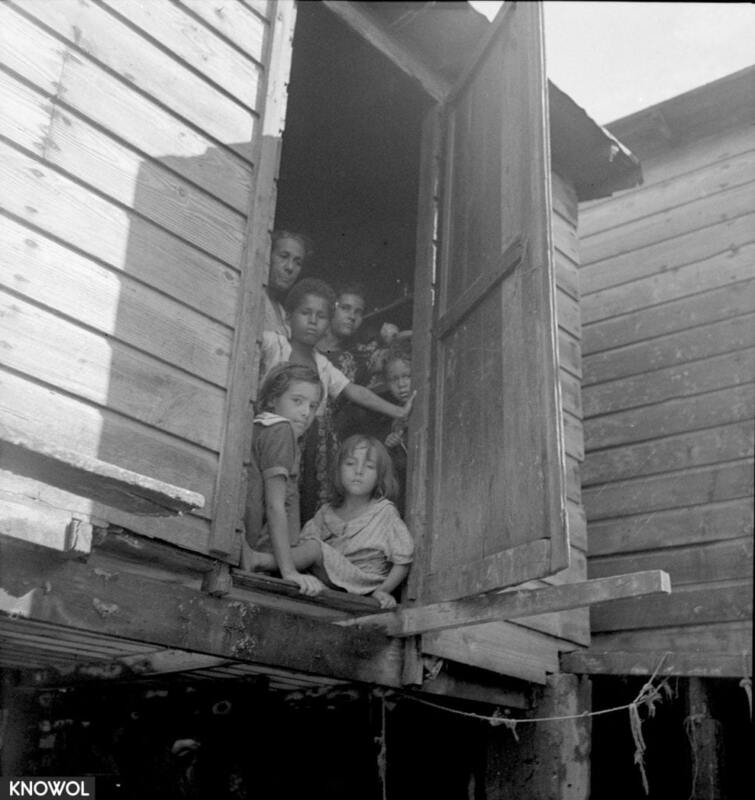 This picture was taken in December, 1941, and shows a family peeking out from their hut. 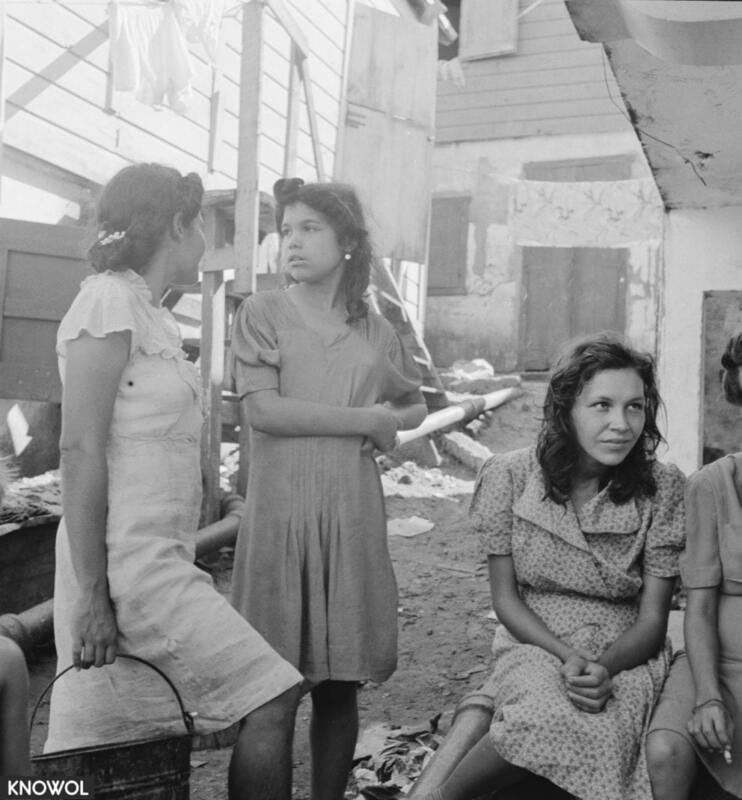 A group of young Puerto Rican females talking in La Perla. One can be seen carrying a bucket which was likely used to collect fresh water. Picture from December, 1941. 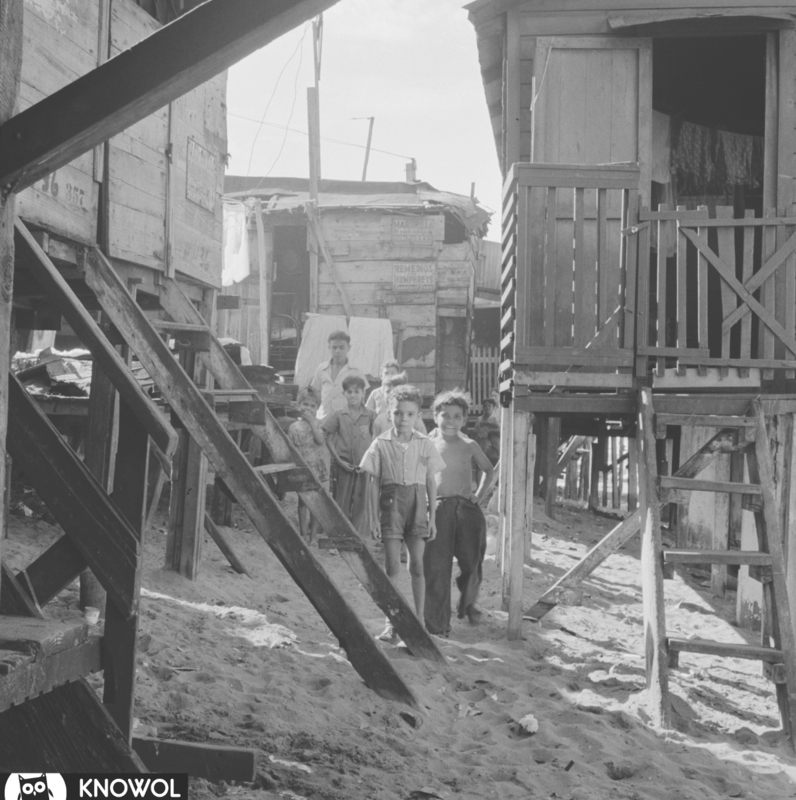 The houses were built on stilts because of their proximity to the shore. 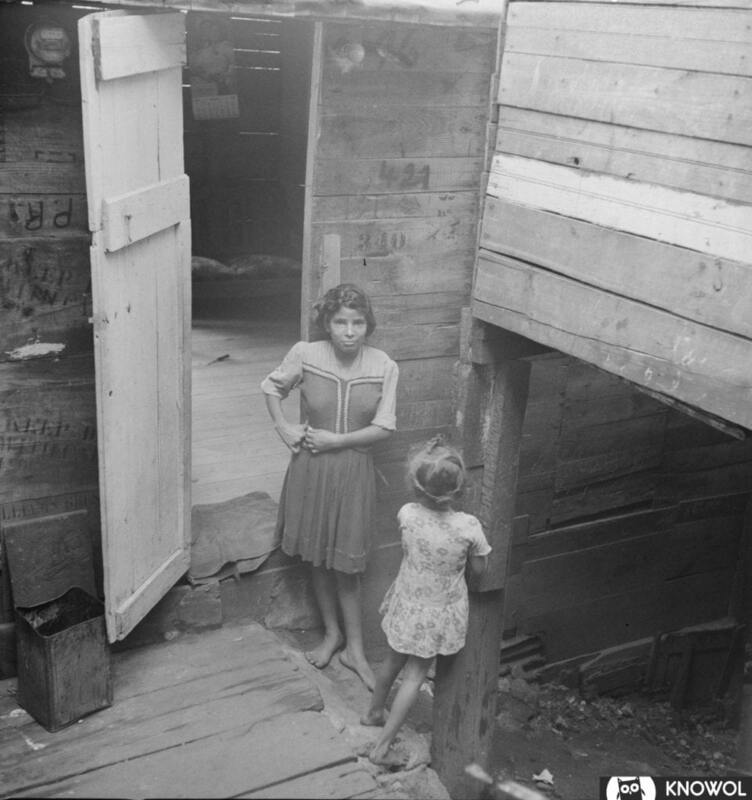 When the tide would rise, many parts of the area would flood, so the huts were built on stilts to keep the residents of La Perla dry. 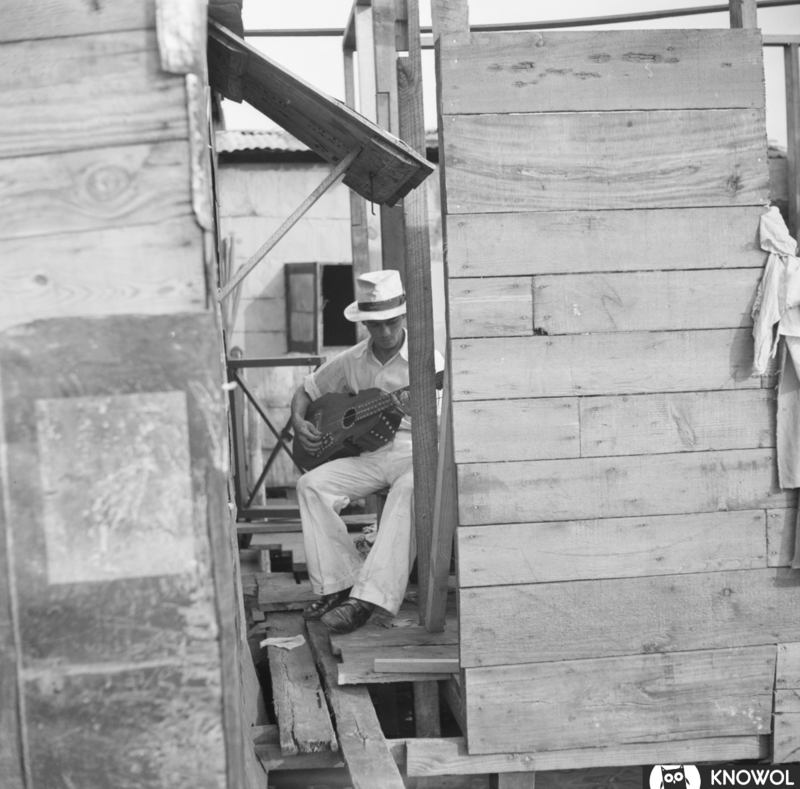 Man playing guitar above the swamp water in the workers’ quarter of Puerto de Tierra. San Juan, Puerto Rico. 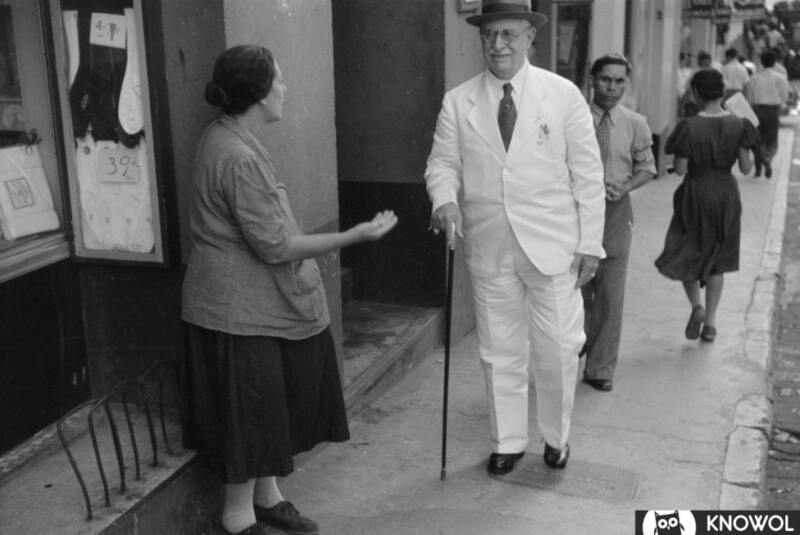 January, 1938. 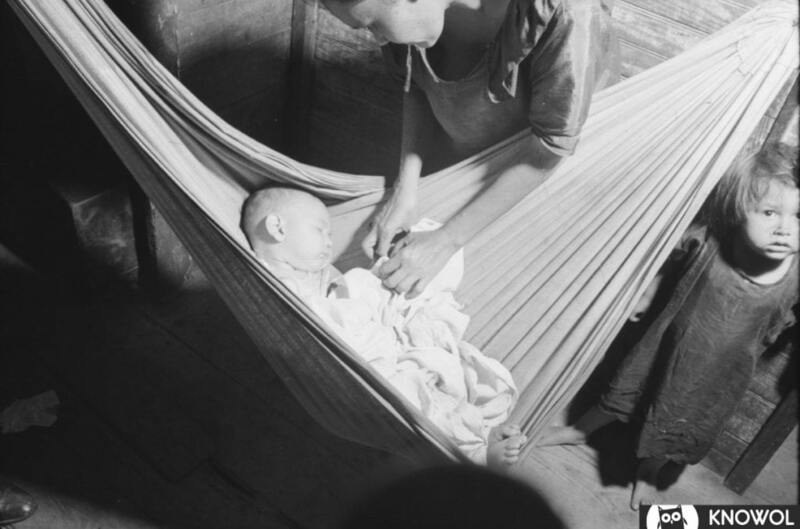 The hammock saves space in a shack already overcrowded. Puerta de Tierra, San Juan, Puerto Rico. January, 1938. 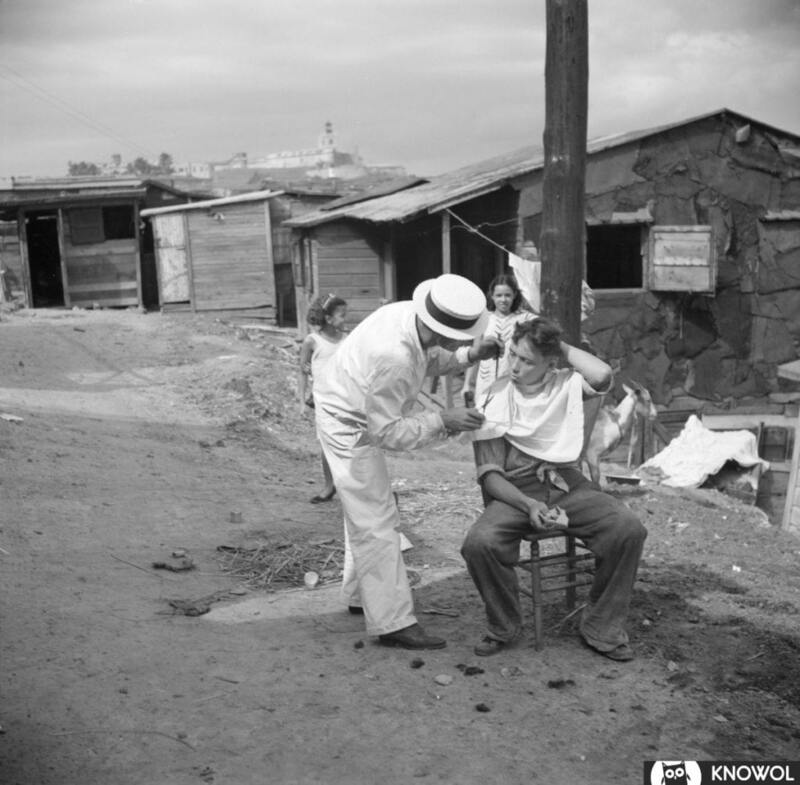 This barber would set up shop in the worker’s quarters of La Perla and cut hair outside. If you look closely, you can see what seems to be one of the fortresses in the background. January, 1938. 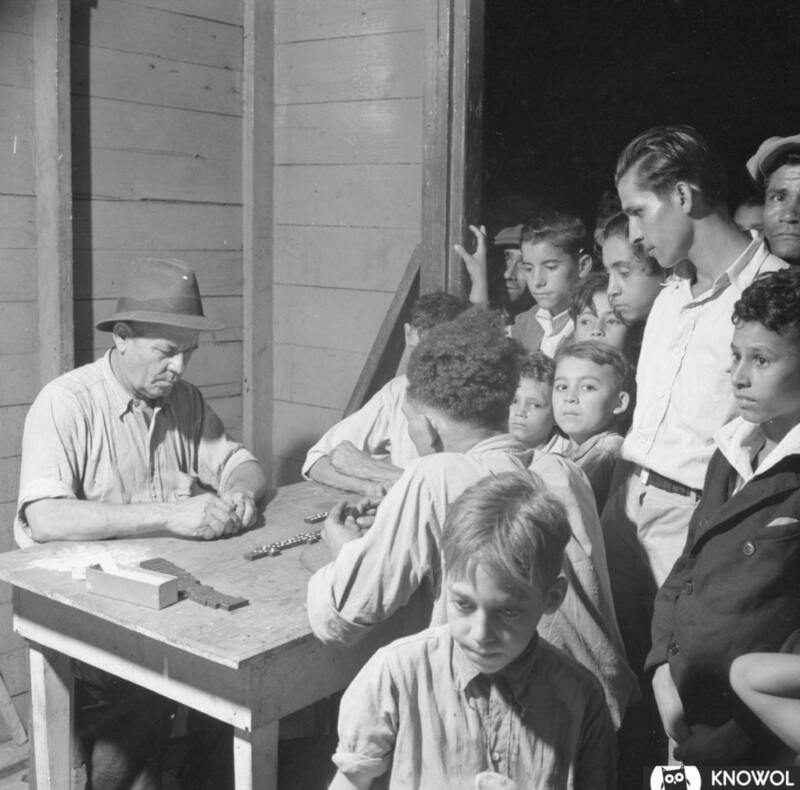 Two men playing dominoes while a crowd gathers around to watch. January, 1938. This is common and there are no controls to ensure cleanliness or keep away flies. 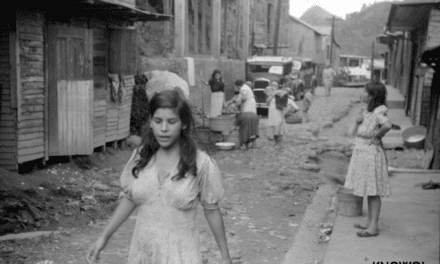 If you look in the background you can see a sign for Corona beer for sale. San Juan, Puerto Rico. January, 1938. In the Rio Piedras seection of San Juan. January, 1942. 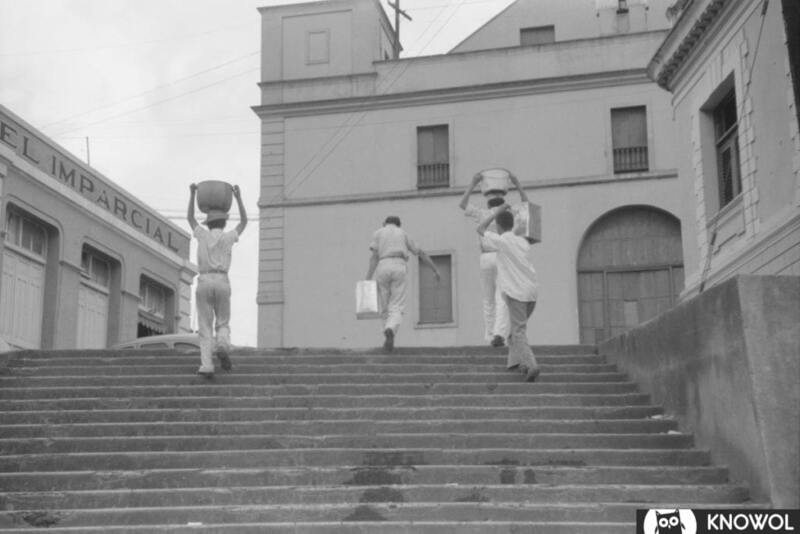 People carrying water home because of the failure of the water system in San Juan for three days. January, 1941. 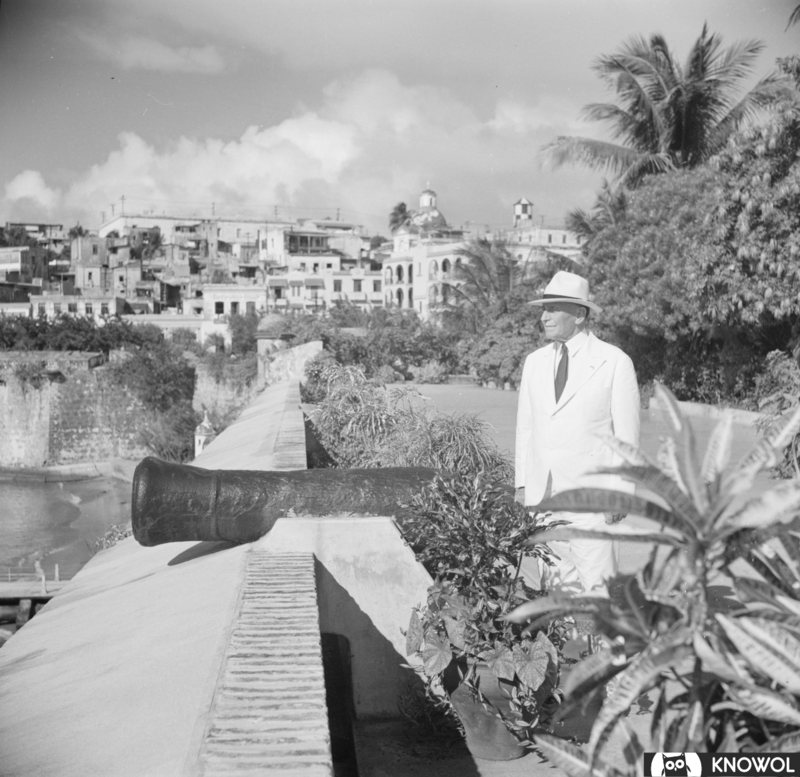 Governor Winship on the ramparts of the governor’s palace in Puerto Rico. January, 1938. 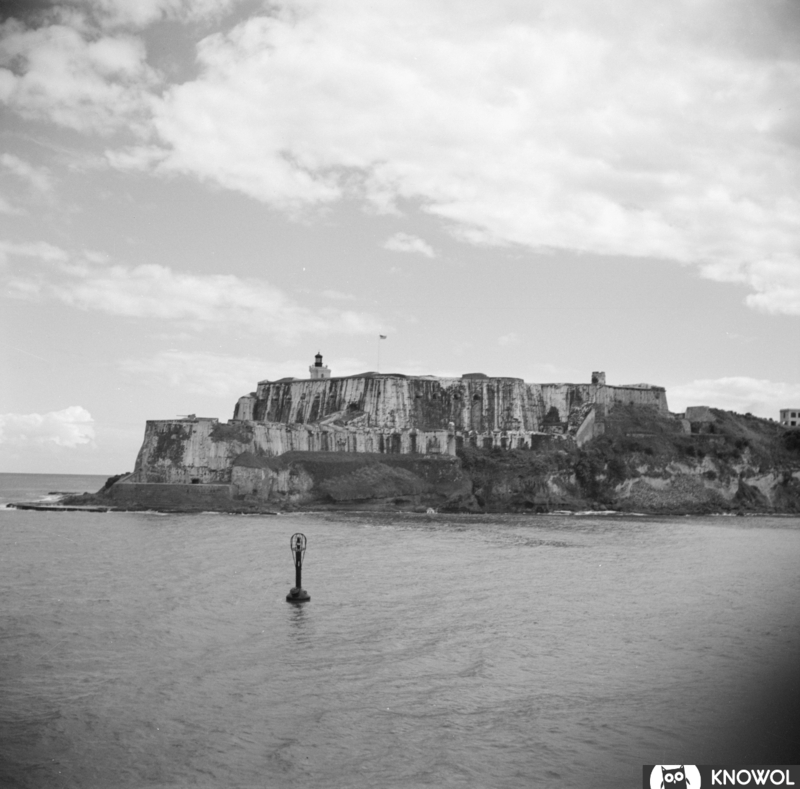 El Morro, the historic Spanish fort from the sea. San Juan, Puerto Rico. January, 1938. Share with family & friends using the buttons below!